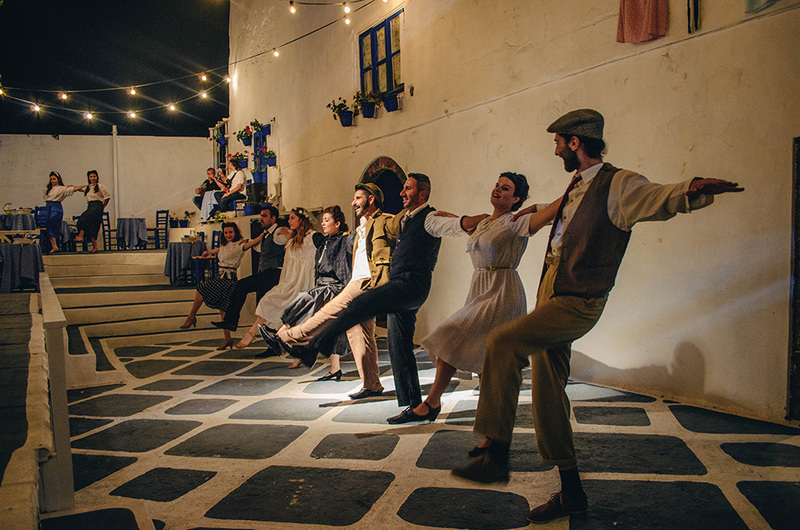 A different entertainment in Santorini. 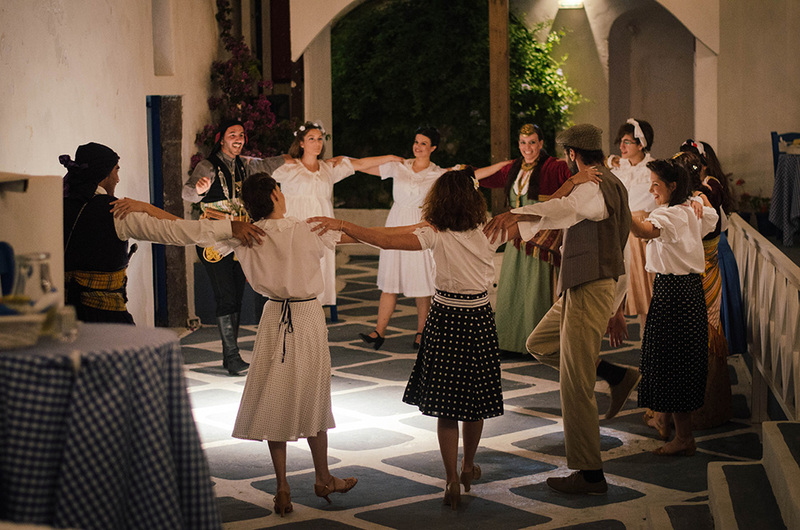 You are invited to take part as a guest in a traditional Greek wedding. A life changing ceremony, a group celebration. Be part of the story. Meet the family. Eat, drink, dance, and break plates. The custom is traditional. 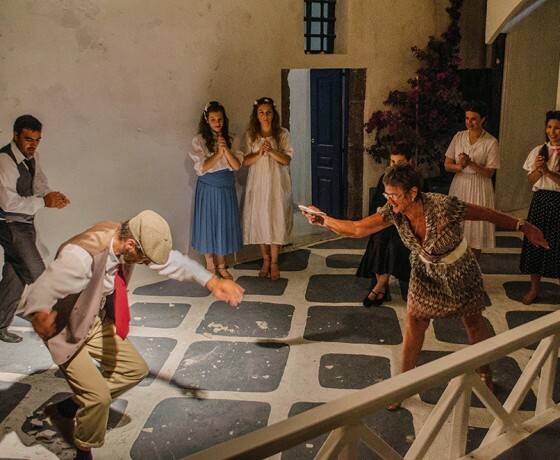 THE GREEK WEDDING SHOW is not only a “Greek night” but an interactive show. 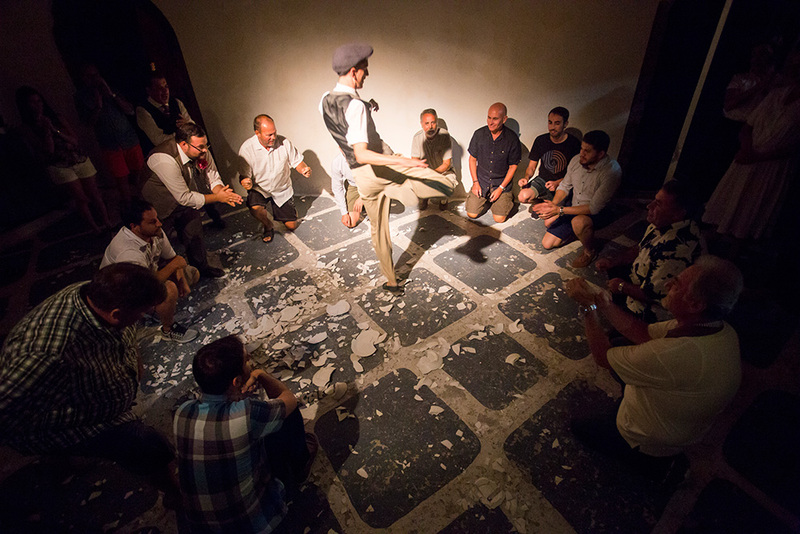 A unique musical designed for visitors to the island who want to engage with the local culture in an entertaining way. International travelers to Santorini looking for a full Greek experience. Weddings are an event where everyone can connect to, regardless the culture. 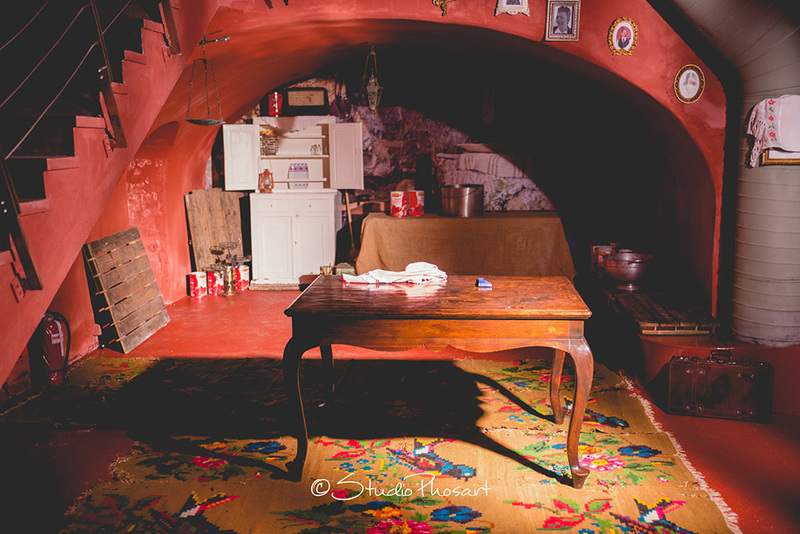 Our show is suitable for adults and children, groups or individuals. The site “White Door Theatro” is a 500sq.m. Complex situated in the heart of the capital town of Fira, with capacity of one hundred people. There are two entrances/ exits, one on the main pedestrian road in the shopping district, and the other on the main street with vehicle access, convenient for transport. 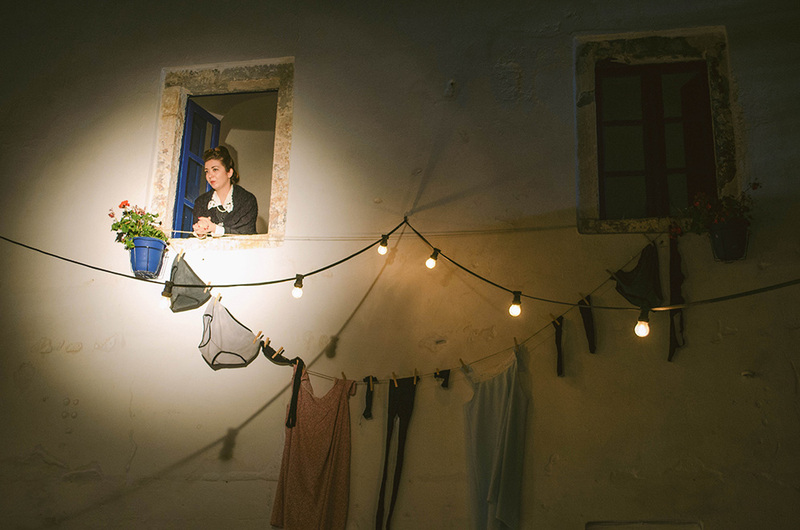 The 200 year old building’s interior is exemplary of traditional island architecture, with rooms separated by walled arches, leading to a private, trellised outdoor patio. The theater’s capacity is up to 80 people. For about ninety minutes, a professional cast of actors and dancers will delight us with a unique spectacle of acting, dancing and live music. 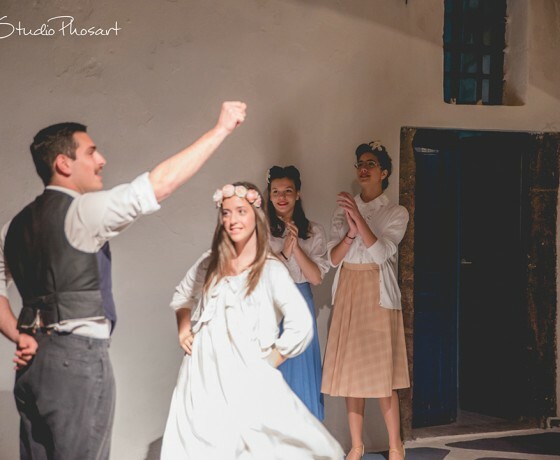 Set in the post-war years of the late 1940s, we take part, as we were the invited guests of a Greek family, in the preparation and celebration of a wedding. 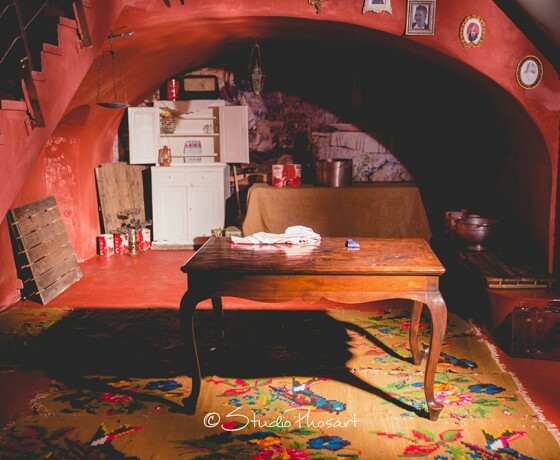 The show begins in the interior of the cava, set as a home, where we meet the members of the family, who will introduce themselves and their stories during the wedding preparations. 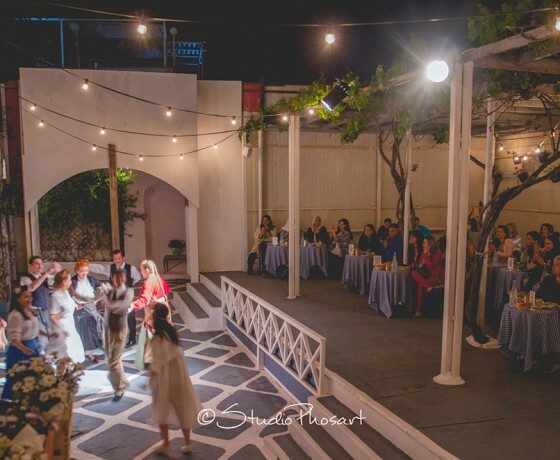 When the bride arrives, followed by musicians, you are invited to the reception at the outdoor patio where at your dining tables you will enjoy a selection of “Greek tapas” reflecting the traditional cuisine of Santorini. 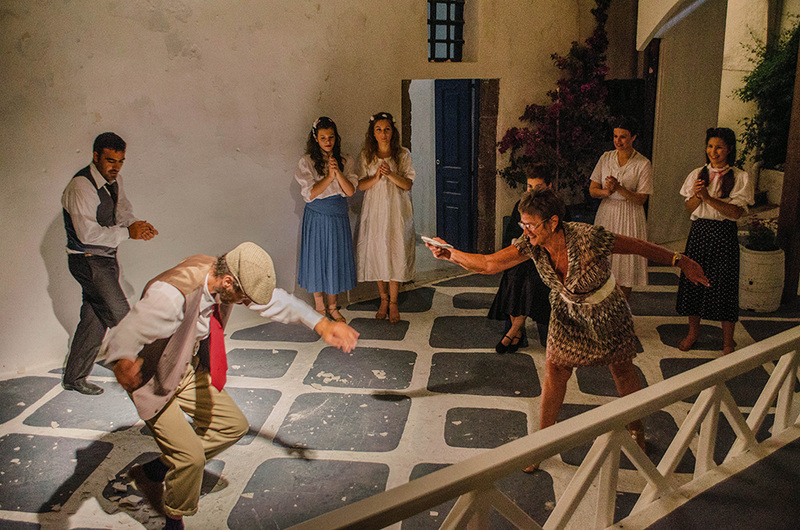 As you savor the tastes of the island, you will take an amazing journey through the best of the music and dance throughout the history of Greece with the opportunity to express your joy, by dancing and wishing good luck to your new Greek family in our special tradition of breaking the plates in the floor. There is no cancellation in case of rain. 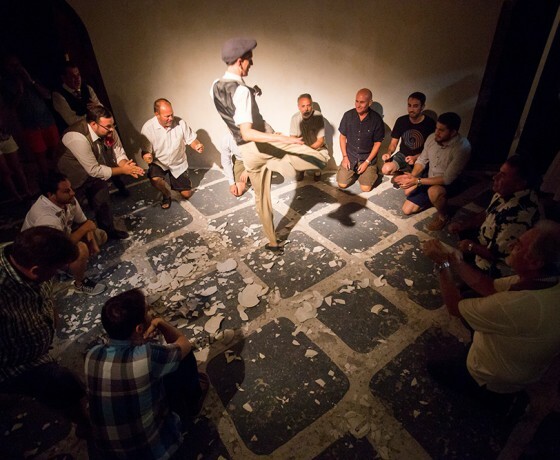 The theater has another “indoor show”, organized and prepared. In that case, our capacity is for 40 people. Regarding this matter, we guarantee that we work, under the real capacity, in order to assure our guest a comfortable and great experience. Tomato pâté, with olive oil, fresh oregano & organic salt. “Tzatziki”, Greek yogurt, cucumber, garlic & fresh herbs with carrot sticks. Anthotiro cheese mixed with roasted red pepper. “Melitzano” Salad, eggplants, garlic, peppers & spices. “Mavromatika”, Greek beans with onions & herbs. Potato Salad with fresh spices, onions & extra virgin oil. 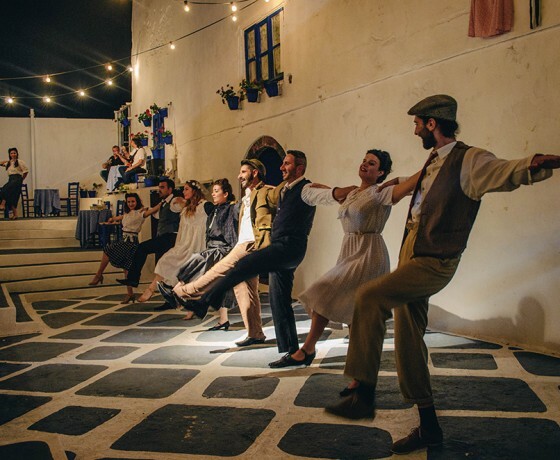 The show consists of an interactive performance of approximately 90 minutes, with singing, dancing and acting, with live greek music, where cold traditional mezedes, water and local wine are offered. Into further details, the show is composed by two parts; one inside the house, which lasts about 15 minutes, during which the audience gets to know the members of the Greek family at the wedding day. 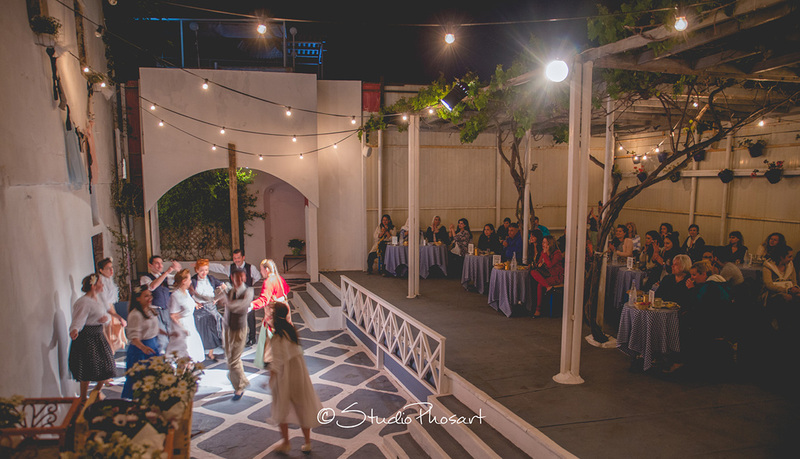 And the second part is taking place outside, at the patio where the guests are sited, accompanied by our staff to the assigned tables already served with the mezedes, drinks, ready to enjoy the wedding party (dancing, singing, and breaking plates). After your reservation online or by the phone, we will send you a confirmation email including a voucher with your payment information, complete operator information and local operation telephone numbers at your destination. 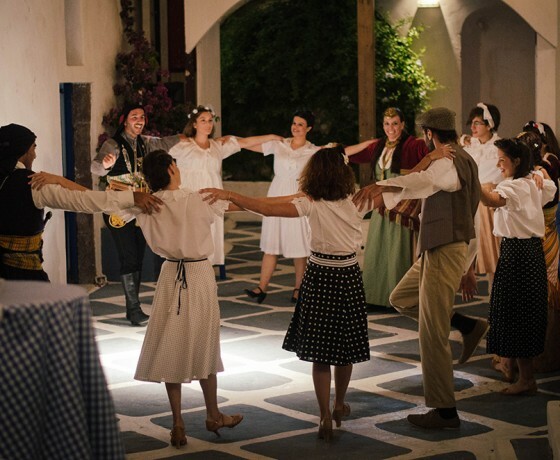 Upon your arrival in Santorini we will arrange to receive your “Greek Wedding Show” ticket at your hotel. You need to present a printed copy of your electronic voucher in order to get your theater’s ticket. For cancelation made 3 full days or less prior to the scheduled day, the full amount is not refunded in the same thing will happen in case of non show. 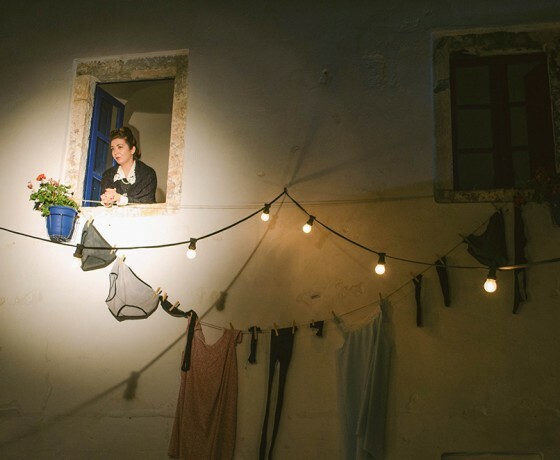 Where it’s located: The site “White Door Theatro” is a 500sq.m. Complex situated in the heart of the capital town of Fira, Erithrou Stavrou str., Fira-Santorini with capacity of one hundred people. There are two entrances/ exits, one on the main pedestrian road in the shopping district, and the other on the main street with vehicle access, convenient for transport. The 200 year old building’s interior is exemplary of traditional island architecture, with rooms separated by walled arches, leading to a private, trellised outdoor patio. The theater’s capacity is up to 80 people.